For those of us who decided that a Jackson Center product was a reasonable and prudent investment, oh how wrong we were. 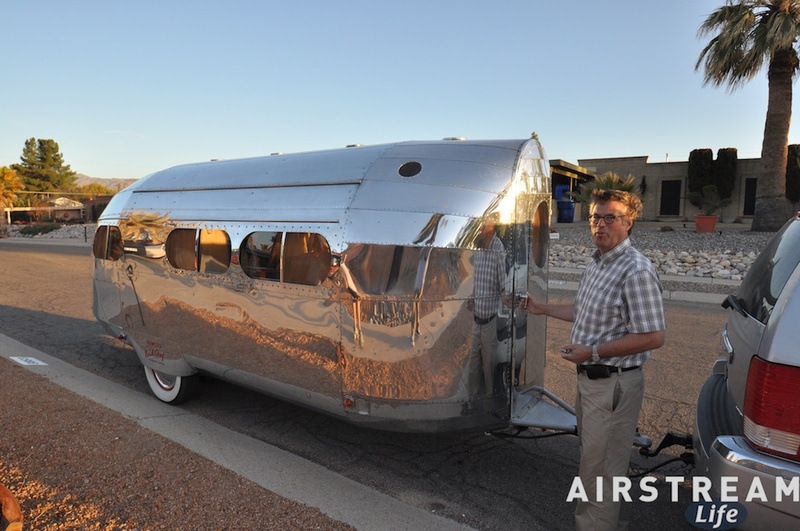 A discretionary purchase for lifestyle and recreational use, yes, but can any Airstream match the result below ? Jan 21, 2011, at the Gooding Auction in Scottsdale, AZ , lot # 137, a 1935 Bowlus Road Chief in “used” condition sold for $ 187,000. No, this is not a misprint….one hundred eighty seven thousand dollars and no/100 cents. Exhibited with a rare 1938 Tatra coupe which was not included as part of the sale. From Pebble Beach, noted car collector, Jay Leno, visits with Tatra owner, John Long, in this seven minute video if you choose to click here, as it is quite informative and entertaining. 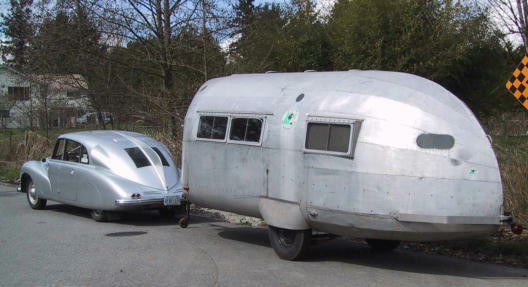 Pictured below, from the man-in-the-maze blog of March 8, 2011, is John Long’s Bowlus Road Chief, a totally restored version (not the Gooding sale road chief) and clearly more valuable than the Arizona estate in the background. Snacking is a fun thing to do, but did you know that it can also be good? Are we a nation of idiots ? On the perimeter of the same shopping mall, a Golden Corral restaurant banner, 30′ wide, proclaims, “Help Yourself to Happiness” and across the highway, the Golden Arches promotes The Happy Meal, apparently not decomposing for 180 days, a delightful combination of burger, fries, and a cheap Chinese trinket. No sad kids left behind in this pre-school indoctrination. A stack of three (3) slices of THICK CUT french toast layered with a cinnamon roll filling then drizzled with rich cream cheese icing & topped with whipped topping. Or you might choose the Cinn-A-Stack combo of two slices (~ 1010 cal.) by adding two eggs + hash browns (~ 1080 cal.) and your choice of 2 strips of bacon or pork sausage (~ 180 cal.). Not taken into the calorie accounting, sugary soft drinks, butter, and fruit syrup over the gigantic mess. Just think, enough calories to sustain an average adult for two full days, and it’s only breakfast, a corporation concocted dessert….the most important meal of the day from an old refrain. And on this Sunday morning, a line has formed while people wait to be seated. I can be both empathetic and sympathetic having once fought bulge myself. Watching friends die too young, and painfully, from diabetes, congestive heart failure, and colon cancer, is the most effective appetite suppressant. What makes me happy is being an old curmudgeon, a fuddy-duddy, who can still get nauseated at our collective excess. When I’m no longer able to puke, it will be time to go. Today when I get home my lunch will be a scoop of funky monkey ice cream on a bed of cheetos and lathered with a layer of mustard, washed down with a cherry coke. So giddy I’ll want to die.